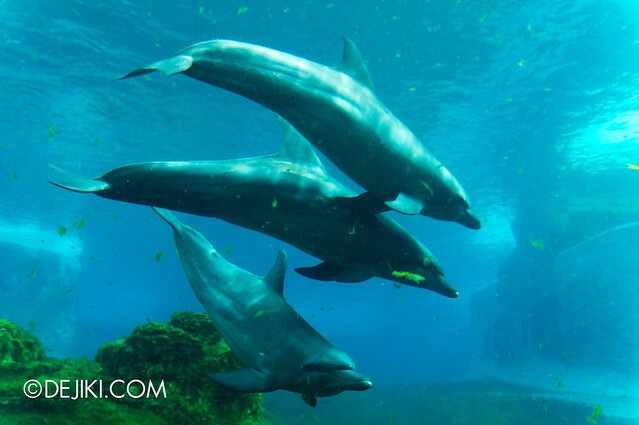 With the recent unveiling of the dolphins and aggressive sales promotions, the S.E.A. 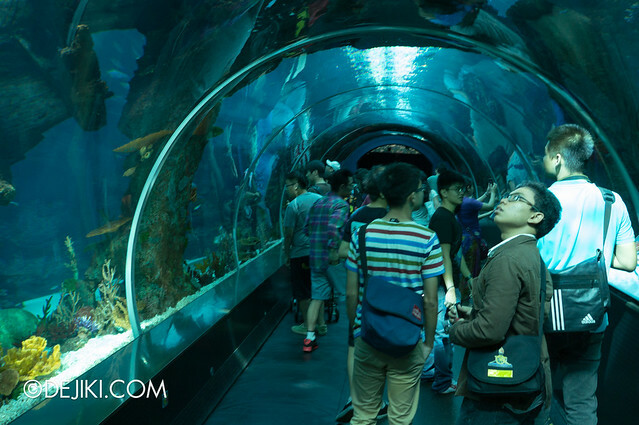 Aquarium (and Adventure Cove Waterpark) is stealing limelight from Universal Studios Singapore. I’m sure some of you have heard that Universal Studios Singapore suffered a dip in daily attendance this quarter (despite new Sesame Street attractions – but that is another discussion). In contrary, Marine Life Park seems to be doing rather well. 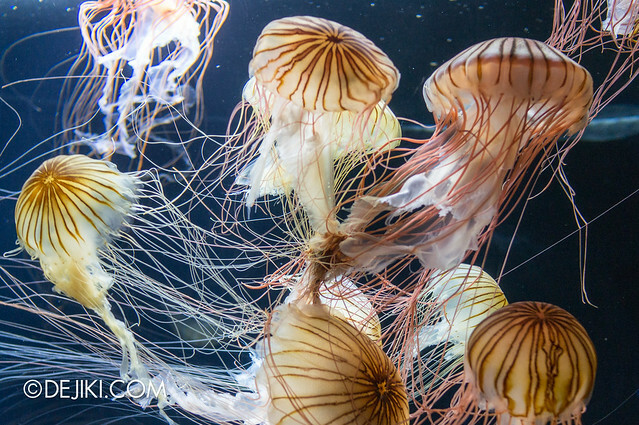 I have not been able to have a peaceful (or more accurately, tranquil) experience at the Aquarium – it is so crowded that finding a quiet spot to view displays is a challenge. According to Malaysia’s The Star, Marine Life Park has an average daily visitorship of 7400 in Q1 2013 (Universal Studios Singapore: 8400), which is rather incredible, given the much reduced guest capacity (and things to do) at both S.E.A. Aquarium and Adventure Cove Waterpark. The S.E.A. 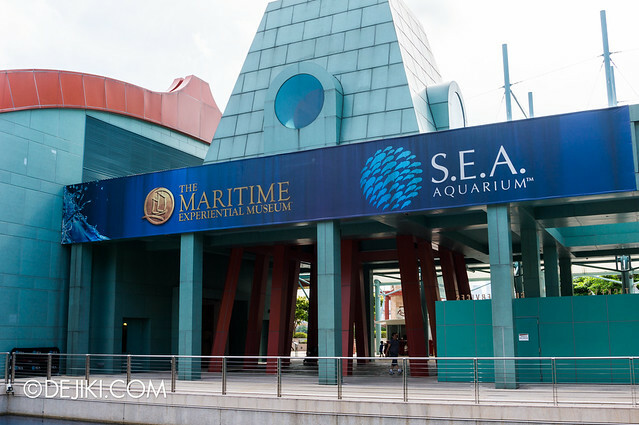 Aquarium has stopped the sale of Annual Passes (on its own or as part of RWS Attractions Pass) a few weeks ago. 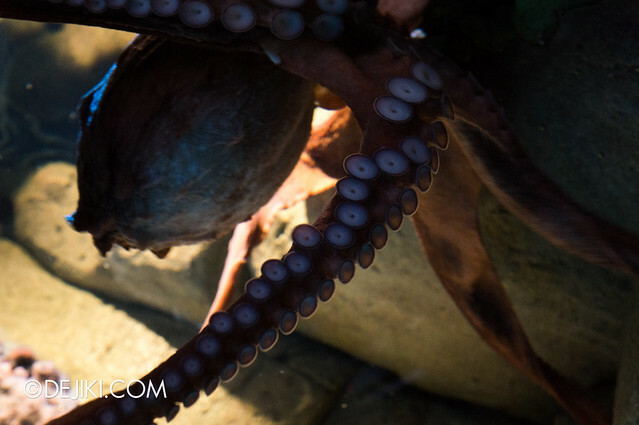 A Giant Octopus at the Ocean Journey zone, right before the sea jelly tanks. 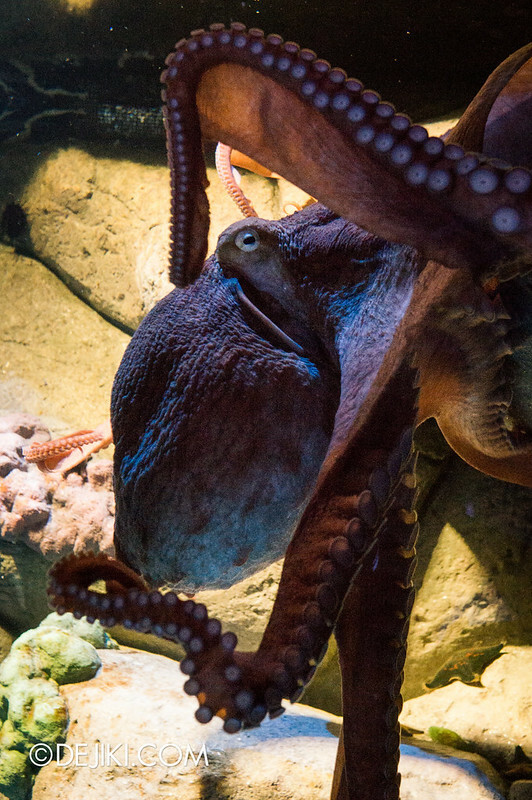 It’s really hard to take a photo of the sea octopus here because (apart from the octopus being a living, moving creature): There are just too many people crowding at a tiny panel, and some people using flash or their giant smartphones/tablets. It’s quite pointless because the photos all turn out unusable and brandishing a large screen in front of the panel just ruins the experience for others. Not sure if S.E.A. 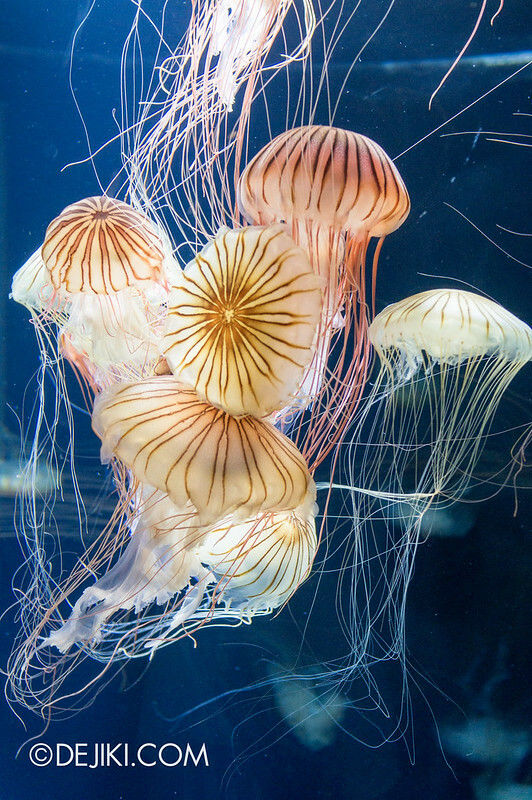 Aquarium has considered setting up a barrier here – the dark and cramped area is a potential safety hazard, especially for small children. 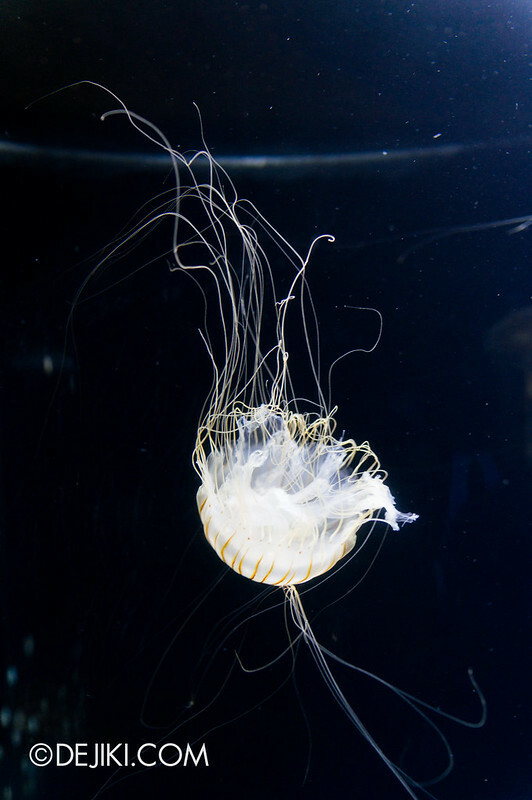 The sea jelly tank which was closed for repairs is back up, now featuring (tangled) sea nettles. 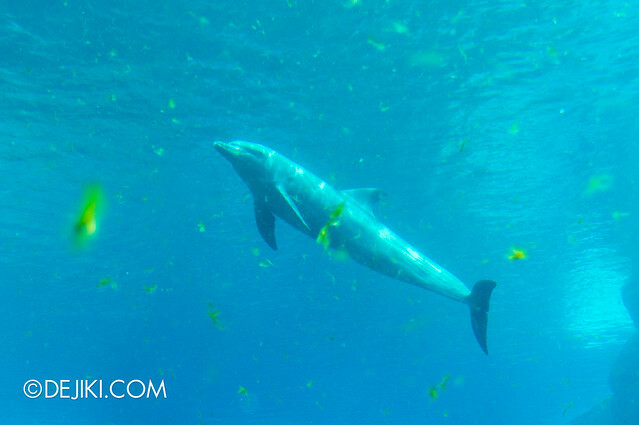 Now then – a third dose of dolphins! 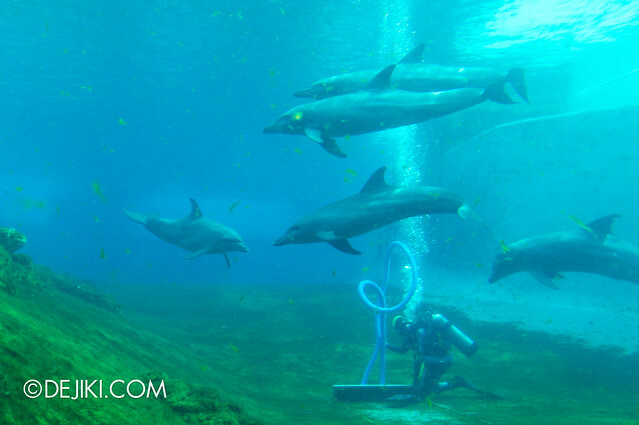 The Dolphin Island display at S.E.A. 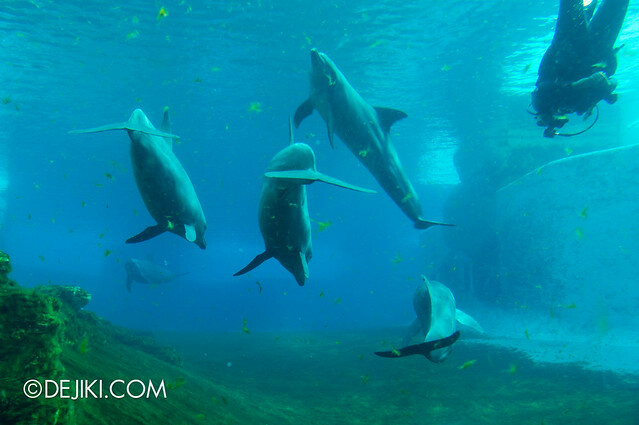 Aquarium has windows that look into the largest dolphin lagoon in Marine Life Park. If you have been following my updates, it’s tank #1 on the map in this entry. Unlike River Safari’s elusive panda enclosure, there is no time limit imposed so guests can stay in this area as long as they want. But be patient and of course, be gracious – don’t hog the windows! 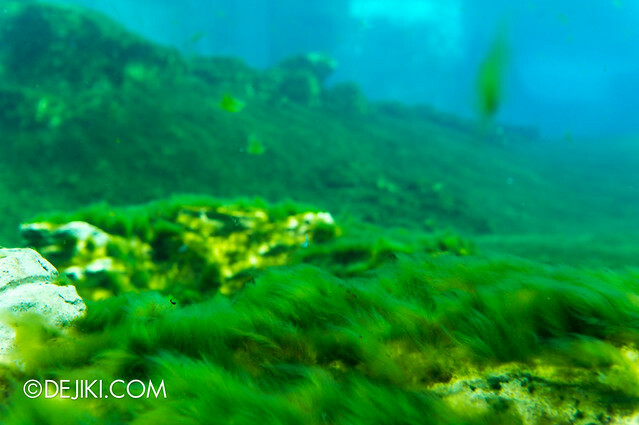 Green algae is intentionally grown in the dolphin tanks to enhance the habitat, though the floating algae clumps are unpleasant to look at. 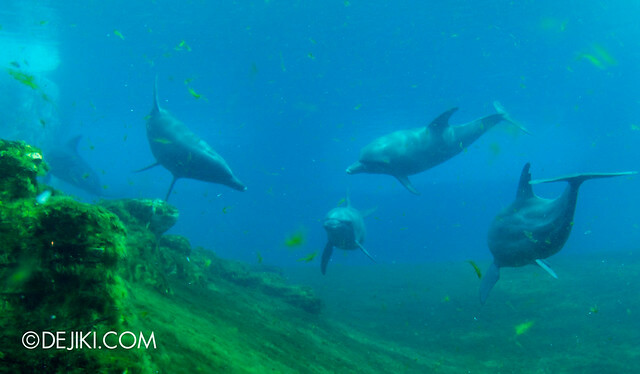 There are only about five dolphins in this large tank. 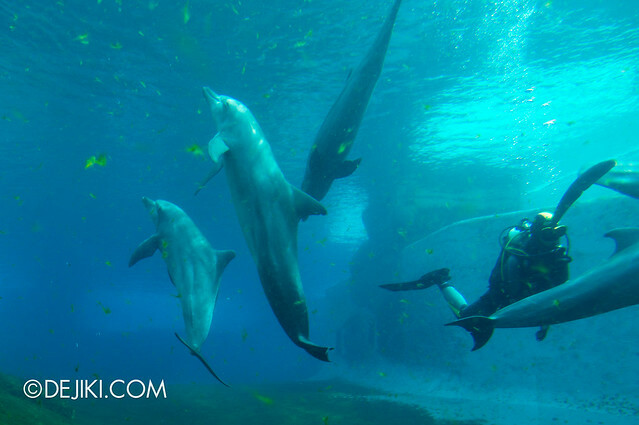 They tend to disappear to the further end of the tank during feeding time (or when dolphin trainers are around). I’m also quite amused that the Marine Life Park crew stationed at this area of S.E.A Aquarium. He could point out all the dolphins by their nicknames. A diver doing some maintenance work at the tank. 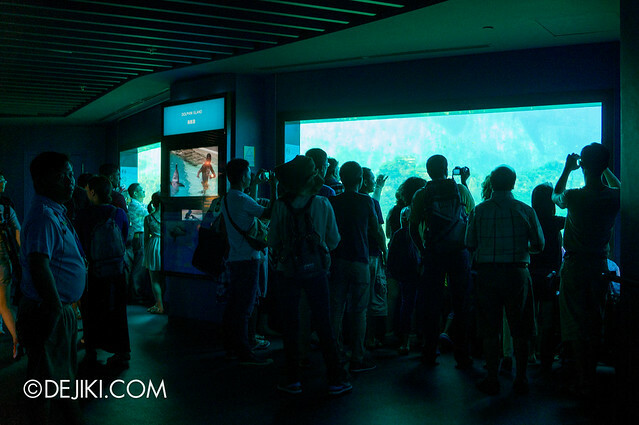 Guests tend to crowd around the first half of the Aquarium (leading towards Open Ocean Habitat) due to the way the path is designed and density of displays. Some guests may also get tired of the displays after the “world’s largest panel” experience. 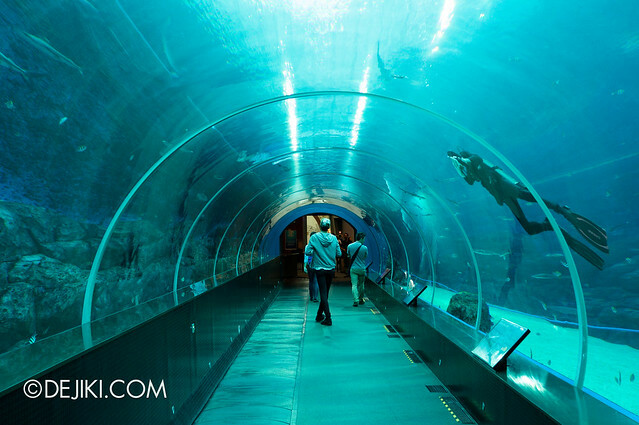 The second half of the Aquarium is usually a breeze to walk through. The S.E.A. 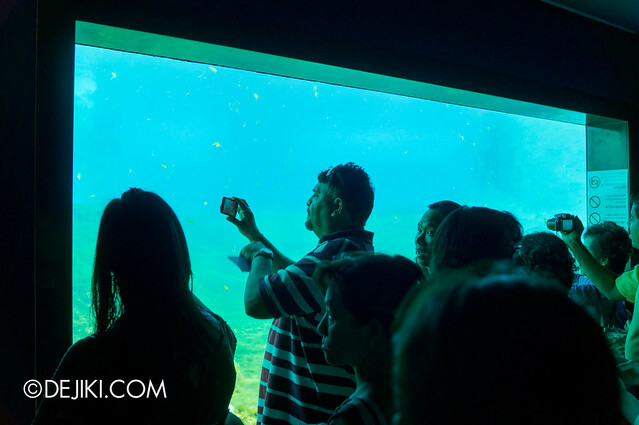 Aquarium is extremely crowded during weekends. Get your tickets early or buy them online to save time and hassle from the long outdoor queue. Also, during days with super high attendance (public holidays), there could be a wait of an hour or longer (in an indoor queue area within Maritime Experiential Museum). The park wants you to buy a priority pass to skip the queue, but alternatively, you can visit on a weekday or during the later part of the day (1-2 hours before the Aquarium closes, but be aware of last admission time). Thanks Timothy – I’ll include that for the June 2013 USS park update!